Several key players in Malaysia have released their performance on 11 November 2017 so here we summarize into 18 key figures by namely Lazada, 11street and Shopback. Singles day (光棍节) or Double-Eleven (11.11) is becoming a major online sale promoted by local e-commerce players recently, on top of the annual #MYCYBERSALE. This is an interesting trend as Malaysia (and the neighbouring countries in Southeast Asia) leans towards 11.11 originated from China (led by Alibaba) instead of Cyber Monday or Black Friday from the United States and western countries. 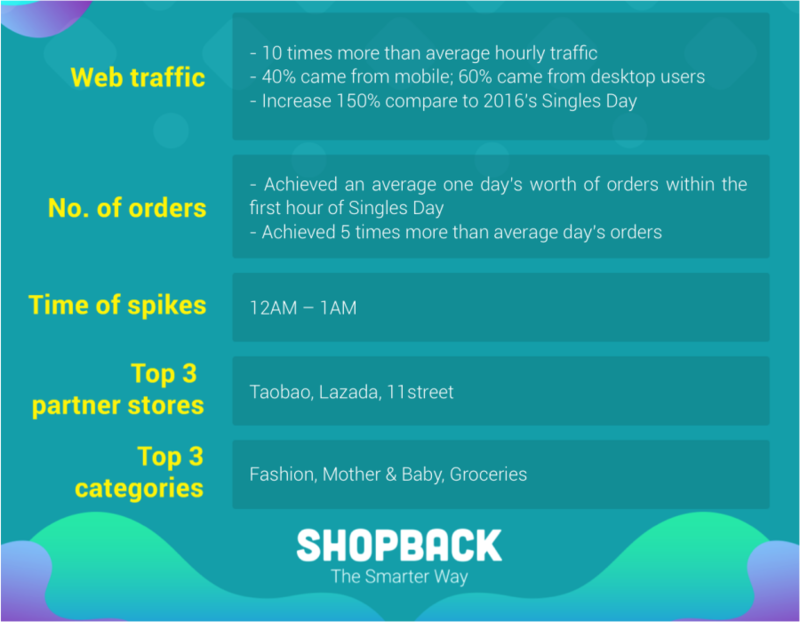 Several key e-commerce players in Malaysia have released their performance on 11 November 2017 so here we summarize into 18 interesting figures by namely Lazada, 11street and Shopback. #1. Lazada Malaysia recorded more than RM100 Million in Gross Merchandise Value in the first 24 hours of the Online Revolution. #2. Lazada Malaysia's website and apps had ~10 Million visits, in a single day, representing a 3X uplift vs 2016. #3. At its peak, Lazada Malaysia recorded an estimated 1,400 transactions per minute. #4. Top Lazada merchants sold more than 50 times a normal day's volumes on 11.11. #5. More than RM1.2 million worth of deals were pre-booked via Lazada 11.11 Giftcards. #6. Top three categories for the sales were: Groceries, Baby & Toys and Electronics. #7. The highest selling products in the first 24 hours were Petronas Fuel Cards, Milo 2.2kg and Pineng Powerbanks. #8. Customers purchased Items from a price range of 81 sen (Tiger Biscuits, 60g) to RM13,499 (Samsung 75" inch UHD TV). #9. In the first 24 hours, more than 32,000 diapers were bought on Lazada Malaysia. #10. 34,000 smartphones and tablets were ordered by customers in 24 hours. #11. Traffic to 11street's website more than doubled with 85% of it contributed by mobile devices in one day. #12. 600% increase in cross-border trading product orders. #13. E-vouchers and services purchase grew by 70%. #14. Highly sought after products on 11street to be GPS, mobile accessories, smartphones, television sets, fuel vouchers, theme park tickets, food & beverage and photobook items. #15. On average, close to 6,000 orders were made in an hour, 6 times of usual performance. Shopback Malaysia topped the chart with over 40 orders made per minute, followed by Singapore with 22 orders made per minute. #16. Almost 60% of the web and app traffic came from new customers. #17. The most popular shopping time belt for Malaysia and Singapore is 12:00AM - 12:59AM - a fact that's largely popularised by Alibaba. Other countries show a different shopping peak hour instead: Philippines: 9:00PM - 9:59PM, Indonesia: 11:00AM - 11:59AM, Thailand: 8:00PM - 8:59PM, Taiwan: 10:00PM - 10:59PM. #18. On a regional level, a customer spent an average of USD30 on 11.11 Singles' Day. For Malaysia, the average spending per customer is lower at USD24 (around RM101). The top spender in Malaysia on 11.11 made RM11K worth of orders via ShopBack, with the bulk of it went to Expedia travel bookings.